We found this mini Klean Kanteen at Pottery Barn Kids. We’ve always loved Klean Kanteen products, as they are BPA-free and don’t use an epoxy lining in their bottles, as many brands do. (Click here for a thorough explanation of the dangers of BPA.) I’ve had my bottle for what seems like forever, as it has proven virtually indestructible. 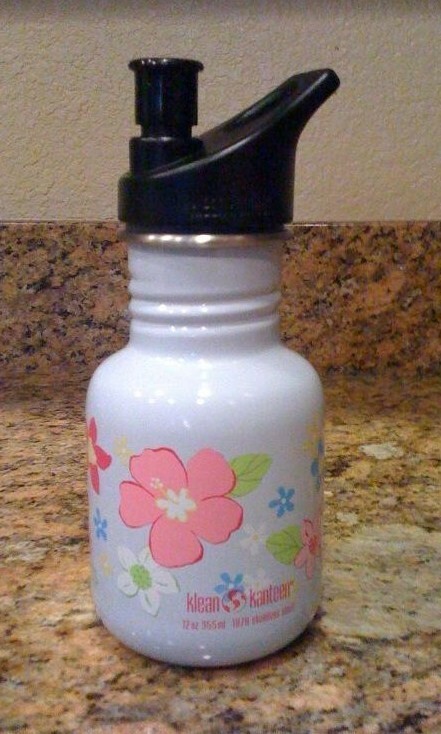 This little 12-ounce bottle is the perfect size for Katie’s cute little preschool-sized hands. She loves blue (of course she does, as everything we’ve ever purchased for her up to this point has been pink! ), so she was elated. We’ve never seen her drink as much water as she did over the weekend. Curious about Klean Kanteen’s new products, I checked out their website and was excited by some of what I found. Not only do they now offer their bottles in a zillion different colors and sizes, but they also carry an insulated bottle. And who knew they had a wine carafe? It holds a full-size bottle of wine and has a wide mouth to ease in both pouring and cleaning. I’m thinking it is perfect for picnics, hikes, and camping. All it needs to make it perfect is a sport top. We need one of these!!! Max & Katie can then be fully ready for their park time playdates!